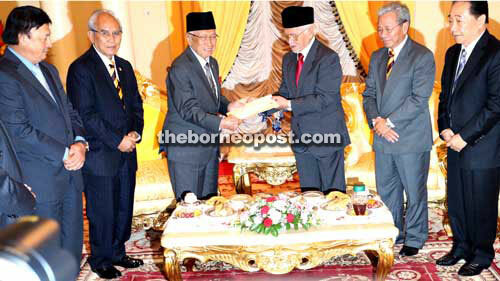 TAN SRI DATUK AMAR ADENAN HAJI SATEM will take over the reins as Chief Minister of Sarawak. After meeting the Head of State Tun Datuk Patinggi Abang Muhammad Salahuddin at the Astana to hand in his resignation to the governor today, Taib announced that he had named Adenan as his successor to a packed press conference. He also said that the Special Functions Minister in the Chief Minister’s Office was expected to be sworn in as the state’s fifth chief minister on Feb 28, the day Taib’s resignation takes effect. No state in Malaysia has been in the limelight over the choice of its Chief Minister as much as Sarawak has over the last few years. Speculation, rumours, wagers and coffeeshop chatter revolved around favourites Adenan, Datuk Amar Abang Abdul Rahman Zohari Tun Abang Haji Openg, Datuk Amar Awang Tengah Ali Hassan and Datuk Sri Effendi Norwawi to take over the helm. Adenan, 70, who was born in Kuching in 1944, once worked as a journalist and teacher before continuing his studies in law at the University of Adelaide, Australia. His early education was at SRB St Joseph and SMB St Joseph, Kuching. 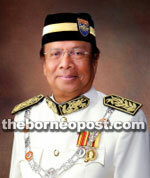 After graduating in 1970, he was appointed as a magistrate in Kuching. 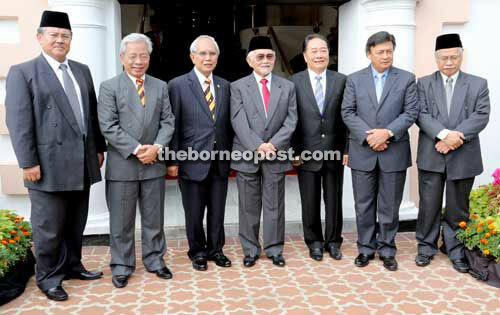 His involvement in politics started in 1976 when he was appointed as legal advisor and a committee member of Parti Pesaka Bumiputera Bersatu (PBB) Sarawak. In 1979, he contested and won twice, once in the by-election for the Muara Tuang constituency in January and again in the state election several months later for the same constituency. He continued to defend the seat, winning every state election held subsequently. He became an Assistant Minister in 1985. In the 2004 general election, he also contested the Sadong parliamentary seat and beat the PAS candidate. Consequently, he was appointed to the federal cabinet as Minister of Natural Resources and Environment. He gave up the post to return to Sarawak. Adenan was moved from the Muara Tuang constituency to Tanjung Datu in the 2006 state election which he won. The Tanjung Datu assemblyman was appointed Special Advisor in the Chief Minister’s Office on April 2, 2010. He was later appointed Minister with Special Functions on June 6, 2011. Among Adenan’s other credentials were: chairman of Sarawak Foundation (since 1998), chairman of Swinburne University of Technology Sarawak Campus Council (since 2004), chairman of the Sarawak Malay Culture Foundation (YBMS), Board of Directors for Sarawak Higher Education Foundation (SHEF) and Board Member of Curtin University of Technology Sarawak Campus Miri. As a member of the State Legislative Assembly since 1978, he held the post of Federal Minister for Natural Resources & Environment from March 31, 2004 till Feb 14, 2006), state Minister for Agriculture & Food Industries (January 1998 — March 2004), Minister for Social Development (September 1992 – January 1998), Minister for Land Development (March 1987 – September 1992) and Assistant Minister for Land Development (July 1985 – March 1987). Adenan also oversee matters relating to Rela, Malaysian Anti- Crime Foundation (Sarawak Chapter), Suhakam, Education Department, Dewan Bahasa & Pustaka, Information & Broadcasting. Married to Datin Sri Jamillah Anu, Adenan has five children. His hobbies are fishing, hunting, golfing, reading, writing and amateur historian. THE CLOSING CHAPTER: Taib signs the document held to him by Abdullah Saidol, chief political secretary to the Chief Minister. WITNESS HISTORY IN THE MAKING: His Excellency Salahuddin receives Taib’s resignation which will take effect on Feb 28. Witnessing the historic occasion from left are SPDP president Tan Sri William Mawan Ikom, Deputy Chief Minister Datuk Patinggi Alfred Jabu Numpang, PRS president Tan Sri Datuk Amar James Masing and SUPP Sibu branch chairman Datuk Seri Wong Soon Koh. 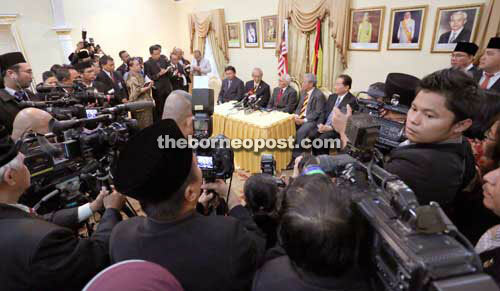 JAMMED PACKED: Taib making the announcement of his chosen one to a packed room of media personnel. ONE FOR THE ALBUM: (From left) State Secretary Tan Sri Datuk Amar Mohd Morshidi Ghani, PRS president Tan Sri Datuk Amar James Masing, Deputy Chief Minister Alfred Jabu, the fourth Chief Minister of Sarawak Pehin Sri Taib Mahmud, SUPP Sibu branch chairman Datuk Seri Wong Soon Koh, SPDP president Tan Sri William Mawan Ikom and State Attorney General Datuk Abdul Razak Tready. RELAXED AND IN HIGH SPIRITS: Taib waves to the crowd as he leaves the Astana after handing in his resignation and announcing the Chief Minister-in-waiting, ending years of speculation.